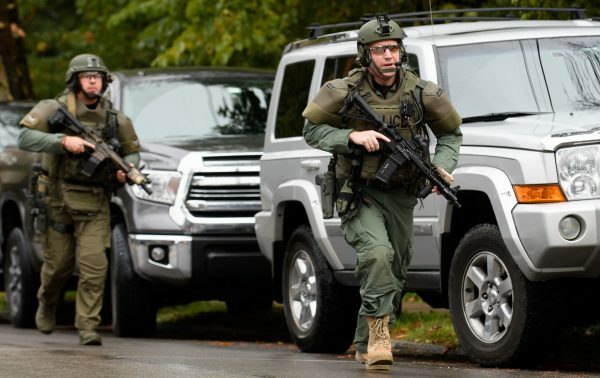 The suspect of the Pittsburgh synagogue shooting has been identified as 46-year-old Robert Bowers of Castle Shannon, Pennsylvania. Bowers has been arrested and hospitalized. The shooting occurred on Oct. 27 at the Tree of Life Synagogue in Pittsburgh’s Squirrel Hill neighborhood during a Shabbat religious service. Eleven people were killed and six others injured. Four officers were shot during the incident and suffered non-fatal injuries. The full motive for the shooting is still unclear at this time, although a police source told KDKA that the suspect had walked into the synagogue yelling “All Jews must die” before he opened fire. A local hospital said it was treating multiple victims in relation to the shooting. Paul Wood, the chief communications officer for the hospital system, said that the patients are receiving care at UPMC Presbyterian, but he did not reveal how many were there. The synagogue was holding a Shabbat religious service that started at 9:45 a.m. ET, according to the organization’s website. Pennsylvania’s Attorney General Josh Shapiro told the press that a baby naming was being performed at the time. Sam Schachner, the president of Tree of Life, said in a phone call he had no comment at this time. Israel is expressing its shock and concern, and offering assistance to the local community following the shooting. Minister Naftali Bennett, Israel’s Cabinet minister for diaspora affairs, made the comments shortly after news of the shooting reached his country. Bennet said he is “following the news with concern,” and has instructed Israel’s Ministry of Diaspora Affairs to prepare to assist the community in every possible way.